Desktop Magnifying Lens 2x Magnification, Easy To Use. We accept online and offline orders from individuals and official bodies with a variety of payment methods. Click here for more information. Are you getting frustrated by all the small print? Maybe it’s about time you made it seem not so small? Thanks to this ingenious desktop magnifier you can say goodbye to squinting and make it a thing of the past! With a unique "Fresnel" type swivel desktop magnifying lens capable of revolving 360 degrees. 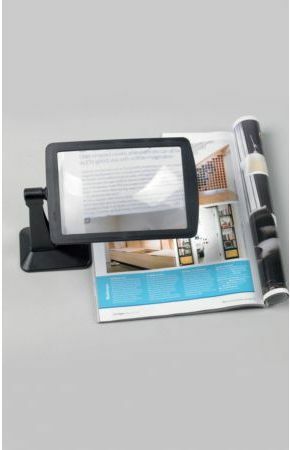 This enables 2x magnification to make everything clearer - making reading, or intricate hobby work much easier. Its quality plastic construction makes for a extremely lightweight device, meaning that it can be taken and used practically anywhere! Click the black square to submit your review. Very happy with this item and fast delivery . Copyright © 1999 - 2019 Active Mobility Centre Ltd. All Rights Reserved.